So, my first ever post! How exciting! Figured I’d start with something fairly easy: how to store make-up tools and products. My interest in make-up started maybe one year ago, mostly because I just needed a hobby and some relaxation. I had way too much work to do (and in other words, yes, I needed to procrastinate! 😛 ), and make-up was a really great escape. So the more passionate I became about make-up, the more storage room I needed for it… But I was never too happy about the various solutions I came up with: either things seemed too cluttered, or too impractical, or very hard to clean. My final solution? Boxes, cups, lids and drawers. Many of them! 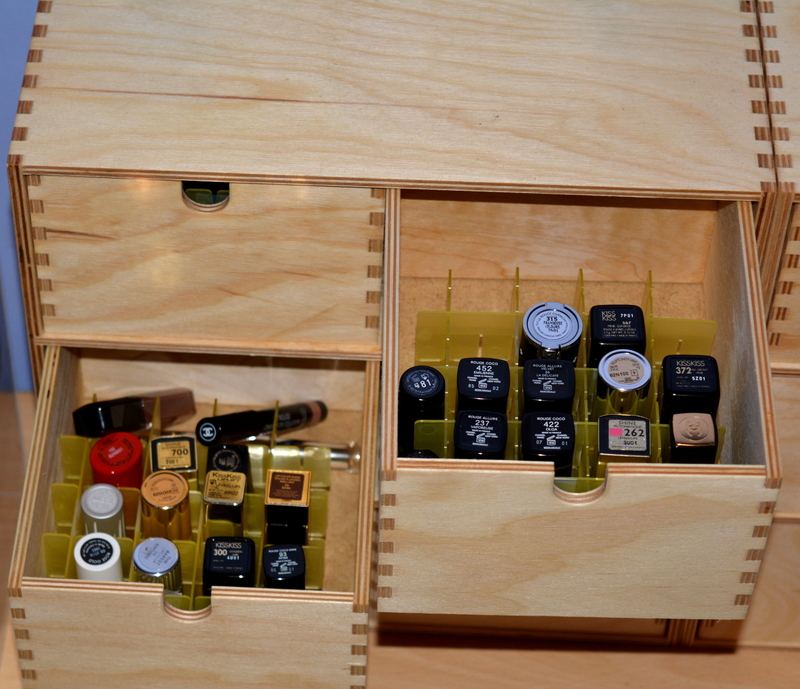 I’ll discuss all this in two sections – storing brushes, and then storing make-up products. Here we go! As an aside… please excuse the fingerprints on there 😉 It just gets used often! The issue is, I believe, a lot simpler here. But you still probably need something both useful and nice-looking, and that can be tricky to find. I’ve had a wander around Ikea one day, and found the MOPPE storage units – and they’ve been miracle workers for me! They don’t take up too much space, and make it so easy to categorize all my products! You’ll also notice the dividers / grid separating all the lipsticks: another little gem from Amazon. These particular ones are called ‘Camlab dividers’ – beware though, they are a bit too short to work with regular-sized lipsticks. So I needed to stack two grids on top of each other to make it work – but the final result it just great. No more time wasted looking for a particular shade! On to the second, bigger MOPPE unit. I like this one for storing other types of make-up, like powders and eye shadows. Below is a drawer with a bunch of pressed and loose powders. Again, so neat! Tsk… more fingerprints. Don’t judge though, that is a Tom Ford eyeshadow palette, so who could blame me?